I thought I would do a review on one of my favourite things in my makeup bag right now. I absolutely love pressed powders. It is perfect for my combination skin. I use it to blot out oiliness, control shine and give me a smooth illuminating finish on my face. 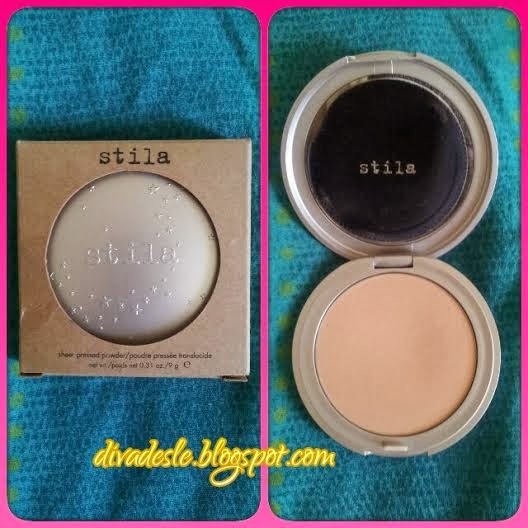 While browsing on the Style36 online store I found the perfect pressed powder for me in the Stila range in shade Medium. The pressed powder comes in a pretty silver round casing with embossed stars on it. I am a sucker when it comes to pretty packaging so this one gets a definite thumbs up from me. Inside the compact is a big round mirror which is great to use when you are travelling and need to apply your makeup in tricky places. The compact comes with a application pad which I have to say is not great for applying the powder. I use the pad to protect the surface of my powder from breaking in my makeup bag and to keep it clean. When applying my pressed powder I use my powder brush and lightly dust the powder all over my face. The product transfers easily onto my brush and there is no fallout which I love as I ate messing up my hands and clothes with excess product. I hate it when products land up on the floor instead of on your face, because then it is a waste of product. With this pressed powder nothing is wasted. The powder does a perfect job in controlling shine and giving my skin tone an even look. It has great staying power and has lasted me all day. The pressed powder has travelled with me to Qatar in the Middle East. I used it when I performed three shows a day on stage there. This was my go to product when I performed as it kept my face matte but I still looked natural and radiant on stage. It does a great job in keeping the shine at bay. You will love it! The packaging on that is gorgeous!!!! i've got to try Stila. i think i've only tried their lip products. they have really great quality products. you won't be dissapointed. I'll need to give it a whirl!